Happy Valentine’s Day!!!! This holiday has always been one of my favorites! Last night I was able to experience my first live show with Style Code Live to talk about one of my favorite trends (if you missed it, you can watch my episode here)! I’ve worked with them a lot but have always shot at my home, so it was fun visiting their studio and getting a taste for what it’s like to do a live show. And I’ll be working with them more this year which will be exciting! Though this trip has been SO amazing and memorable, I’d be lying if I said I wasn’t ready to go home to my Valentines… Drew, Isla Rose, Jackson and Dasher! I hope you all celebrate today with the people you love most! Gorgeous outfit, you look absolutely amazing! Love this sweater and bag combo! I love that sweater paired with the white jeans and grey boots, such a cute and causal outfit perfect for Valentine’s Day! Thanks for sharing, beauty, and I hope you have a great week ahead! Love how chic and cute this look is, so pretty! Such a cute, casual look for Valentine’s Day! That sweater looks so sweet and soft! I love the shape of that sweater! This look is everything. I tend to stick to neutrals but you are inspiring me to add some soft pink/blush tones to my wardrobe! This is such a cute look!! The bag is to die for and I love how you’ve styled it witht the burberry scarf! Your segment on Stylecodelive was awesome! Loved it! Love this outfit! Gorgeous photos, Rach! 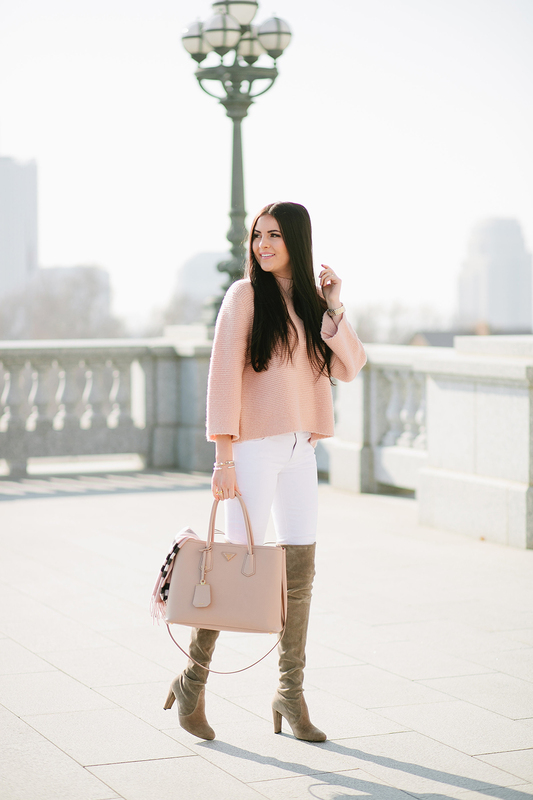 Obsessed with the blush tones! You’re looking so beautiful in this minimalistic and casual outfit! I like your bag and sweater very much. I’m wearing a similar outfit today. Love it! I bet you look fab! Gorgeous look, I love that top. I love that sweater! It’s amazing! Happy Valentine’s Day, Rach! Your bag is stunning!!! Love the pink and white combo. Happy Valentine’s Day! You look stunning! The color of your bag is gorgeous and I just love this look on you! Love this sweater- so cute!! Such a pretty color on you! I love pink for Valentines Day. Gorgeous as per usual Rach! Such a pretty outfit! Love the blush color!